The UN in Somalia says tens of thousands of people will have died of starvation by the time the famine in the Horn of Africa ends. The food crisis was declared in Somalia six months ago and levels of need are expected to remain high until July or August. 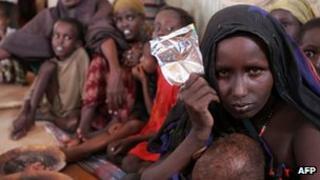 UN aid chief in Somalia, Mark Bowden, told the BBC malnutrition rates there were the highest in the world. He said a quarter of a million Somalis were still suffering from the famine. "We know that tens of thousands of people will have died over the last year," Mr Bowden, said, describing the rates of malnutrition as "amazingly high". "Children will have suffered the most, malnutrition rates in Somalia were the highest in the world, and I think the highest recorded... up to 50% of the child population suffered from severe or acute malnutrition." Mr Bowden said malnutrition rates have begun to drop but the crisis was likely to continue for the next six or seven months. "Fortunately they've started to come down across the board, but that does mean that there will have been a very high mortality," he said. Somalia has not had a functioning central government for more than 20 years and has been wracked by fighting between militias. Although $1.3bn (£84mn) worth of aid has been poured into the country, the BBC's Africa editor, Martin Plaut, says the scale of the suffering is immense. Last year, tens of thousands of Somalis fled rural areas - many over the borders to Ethiopia and Kenya - in search of food. The UN estimates that a total of 1.5 million people have been displaced by the crisis. The UN is calling for additional funds to replenish flocks of sheep, goats and camels so that people can re-build their lives. Aid agencies have warned in recent months that conflict was jeopardising the aid effort, with Kenyan troops crossing into the country to fight al-Shabab - al-Qaeda-linked militants it blames for a spate of kidnappings. Al-Shabab, which controls much of central and southern Somalia and has banned many Western aid agencies from its territory, has denied the allegations.